Since the dawn of history, civilizations have revered the famed "sacred mushroom"--known to botanists as Amanita muscaria--with its mystical, mind-expanding properties. 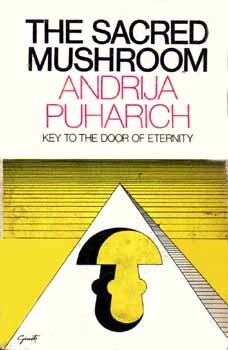 Written by one of America's leading authorities on parapsychology and extrasensory perception, The Sacred Mushroom is the fascinating account of Dr. Puharich's own investigation of the Amanita muscaria. This book describes in vivid detail Puharich's extraordinary association with Harry Stone, a young sculptor of unusually acute extra-sensory perception, who on a number of occasions spontaneously went into a deep trance state and then began to speak and write in the ancient Egyptian language. Identifying himself as Ra Ho Tep, a high-born Egyptian who lived 4600 years ago, he defined the long lost ritual of the sacred mushroom and its astonishing effects upon the human consciousness. But the story does not end with the Ra Ho Tep revelations, for during this period Dr. Puharich and his colleagues were actually guided to the discovery of a splendid specimen of the extremely rare Amanita muscaria, growing in the Maine woods--less than a mile from their laboratory. In addition to recording these eerie personal experiences, Dr. Puharich has written a brilliant summary of the role of the sacred mushroom in history, myth, and religious experience. Dr. Andrija Puharich is an American of Yugoslav descent. He took his medical degree at Northwestern University, and in 1947 began to investigate extrasensory perception (ESP). Dr. Puharich founded a research laboratory in Glen Cove, Maine, and designed and built a special Faraday Cage--a copper-sheathed, double box which enabled him to isolate a "sensitive" within an electrical field and determine that electricity was a significant aid in the study of ESP.